A 4 week course to introduce the fundamental techniques of social tango that are posture and axis, stepping, pivoting, cadence, partner connection and floor navigation. Numerous base figures will be used along the way to establish and strengthen the above fundamental techniques, examples include ochos, corridas, pausing, salidas, cruzadas, and giros. In short, this course introduces you to the improvisational tools of musical expression and navigation that you need to be able to dance in a "milonga" (the place/event where social tango is danced). For good continuity, depth, and everyone's efficiency, we require that all participating commit to the entire 4 weeks. Anyone recently initiated in the art of Tango Argentino, or anyone who would like a comprehesive reworking of the basics, should do this course. when: 4-week cycle, classes on Mondays from 7:00pm-9:00pm (1h15 class, 0h45 practica). 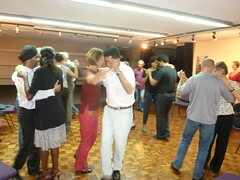 prerequisite: either completed a Tango Initiation Session (at least once) or otherwise has previous tango experience. cost participation: 2500/- per person (hardship rate 1000/-) for the full series, to cover hall rental and other related costs. Plus, as dancing may only be learned by dancing... you are highly encouraged to practice regularly, and with as many different partners as possible... for this exact purpose we weekly offer La Milonga Patamango—the only Milonga between Cairo and Johannesburg—and you are all highly encouraged to attend, to practice, and to join us on all the fun! • No need to sign up with a partner. During the classes we will be changing partners regularly. • For good continuity participants must commit to entire series -- the full series is therefore payable in advance. • First-timer drop-ins are discouraged but possible -- the first-timer drop-in rate 1000/- per class (no hardship rate for drop-ins). • Contrarily, if you have previously worked through the series you are very welcome to join us as your schedule permits and rework through any of the classes -- the second-timer rates are: 1500/- for full series paid in advance, 500/- per drop-in class. Further hardship reduction on these reduced rates is also possible. • Payments may be done in advance by m-pesa to 0715 357 507 or in person on first class day.